The first levels of the HyperconnectedFactories pathway displays similar levels as the Autonomous & Smart Factories pathway: Multi-purpose digital tools are progressively implemented and complemented by dedicated tools that are operating in silos within the company. Communication with other companies is primarily done by e-mails and attachments until reaching level 4, where dedicated IT connections (such as private industrial networks) are established among a selection of long-term value chain partners. Level 5 is a level where dynamic IT connection can be established with new business partners or suppliers. 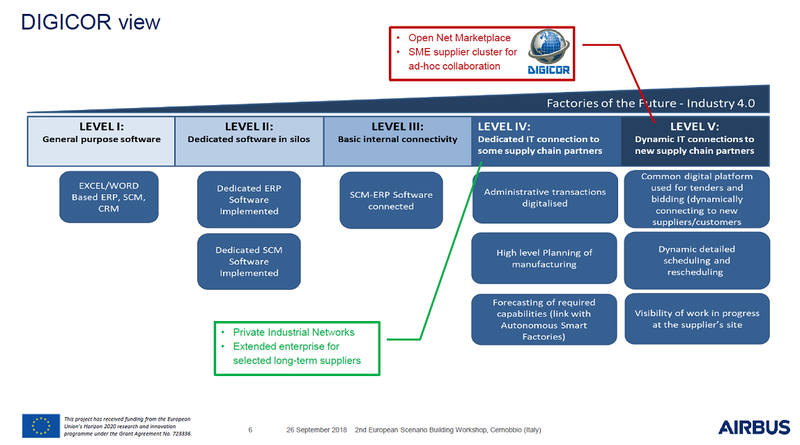 The project DIGICOR provides a very good case of how the expected outcome of that project will enable the realisation of level V, in particular aiming at connecting with SME suppliers or SME-clusters of suppliers. (See herewith an annotated version of the pathway in a presentation done by DIGICOR at a ConnectedFactories workshop).